A Chinese man named Zhang Heng was a brilliant scientist and polymath—someone who has expertise in many areas. Zhang Heng knew things in math; had success as an engineer, an artist, a mapmaker and a geographer. He worked for two Emperors during the Han Dynasty as Chief Astronomer. Zhang Heng became a brilliant astronomer to the powers that be. He named and cataloged the stars. He even discovered that the Moon does not make its own light. To help to facilitate his work, he also invented things to explain more about the universe. For example, he made a planetary sphere or globe that showed the planets in motion. Astronomers had much power in this era, particularly in the Han dynasty. They helped the state by designing and following a calendar. They were often called upon to predict celestial events and they kept records about the heavens. The emperors believed that the path of current life was entwined with the heavens and they looked for any signs that might help them. Zhang often used the analogy of an egg to explain the Earth’s relation to the stars. He wrote that the Earth was like the yoke of an egg. That the sky was large and the earth was small. He also subscribed to the chaotic theory of the beginnings of Heaven and Earth, that once they separated, the light substances went heavenward and the heavy substances formed the Earth. During this time of great study and creativeness, Zhang was inspired by spiritual experiences. An earthquake is scary. The earth begins to tremble, objects fall and household items rattle. At worst, buildings fall and gaping holes open in the ground. Earthquakes are mostly caused by the movement of tectonic plates (also called lithospheric plate). Earth’s rock level is layered with about a dozen large plates of composed materials—granite rocks including quartz and feldspar. The area where two plates meet is called a geological fault (or fault line). What’s at fault during an earthquake? Breaks at or below the surface of rocks, and there are three types: normal fault, thrust fault and lateral fault. A normal fault has the rocks pulling away from each other. Thrust is when they get pushed together. Lateral thrust is when the land on either side moves in the opposite direction and at different speeds. The earth builds up pressure, which becomes friction and shifts, creating shock waves—like a ripple in a pond—and these layers compensate for the imbalance in the weight and density of the two types of Earth’s crust. Shock waves can reverberate through the ground reaching speeds of up to 5 miles (or 8 kilometers) per second. (24 times the sound of speed.) Earthquakes at sea are called tsunamis. The waves they create can race across the ocean at up to 500 miles (805 km) per hour. Earthquake eruption also causes volcanoes and floods. Even though China was the most technologically advanced during the Han dynasty, the Chinese people believed that earthquakes were punishments from the heavens, a terrible fear and burden to hold. In the last 3,000 years, earthquakes in China have killed more than 13 million people. In 132, Zhang Heng invented the world’s first seismograph. That was nearly 1,900 years ago! It looked more like a piece of art. This revolutionary device was made of copper and shaped like a vase, with eight dragon heads at the top hanging upside-down, and open-mouthed frogs at the bottom. When the Earth shook, it sent a bronze ball from one of the dragon’s mouths into the frog’s mouth. Depending on which frog caught the ball, determined the direction the earthquake was coming from. The heads of the eight dragons point to the directions of east, west, north, south, northeast, northwest, southeast, and southwest. At first, no one believed Zheng’s invention. One of the dragons dropped a ball. Since there was no perceivable tremor felt in the capital, his political enemies were briefly able to relish the failure of his device. Soon after, a messenger arrived to say an earthquake had occurred about 250 miles (400 km) away in another province. 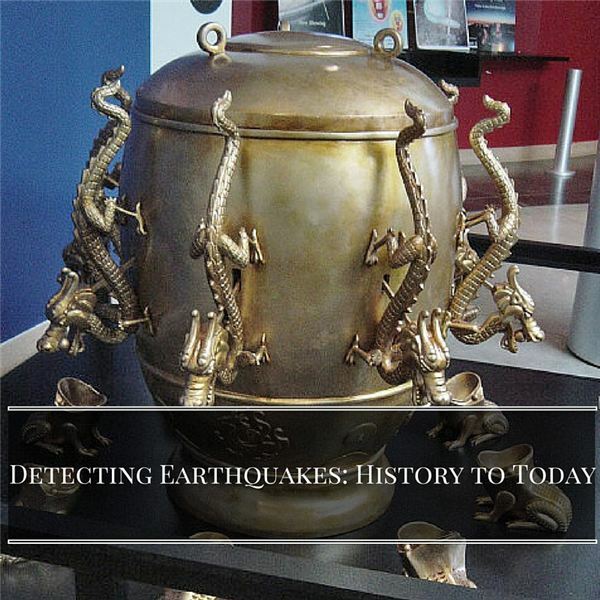 No one else anywhere managed to create an earthquake detector until the 18th century, more than 1,500 years later. Interesting fact: small quakes usually hit before large ones, animals will act strangely and the water in wells may turn muddy. When people in Haicheng, China in 1975 complained about these phenomena, Chinese officials told people to evacuate. Experts say the evacuation saved more than 150,000 lives. Zhang Heng’s scientific achievements were honored by later generations. In 1986, a golden yellow mineral was discovered. Made of 80 percent copper and zinc, 10 percent iron, and 10 percent chromium, the mineral was named after him. In 1970, the United Nations named a lunar crater, the Chang [Zhang] Heng, after him. In 1977, a main belt asteroid “1802” was discovered at the Purple Mountain Observatory in Nanking, one of China’s most important cities, and was named for Zhang Heng, a well-deserved recognition for this great Chinese astronomer. In 1951, Chinese scientists from China’s National Museum worked on recreating Zhang Heng’s seismograph. Since there was a limited amount of information, it took brilliant minds until 2007 to complete the reconstruction! The U.S. Geological Society has 10,000 scientists that keep an eye out for landslides, volcanoes and earthquakes at more than 400 locations throughout the United States. Kespert, Deborah. Genius! The Most Astonishing Inventions of All Time. London: Thames & Hudson Ltd., 2015. Book. Stewart, Melissa. Inside Earthquakes. New York: Sterling Children’s Books, 2011. Book. Davis, Graeme. Earthquakes: Real World Math: Natural Disasters. Ann Arbor, MI: Cherry Lake Publishing, 2012. Book.